This magnificent two-disc album was recorded live the evening of November 6 and into the morning of November 7, 2009. It so happened that Jez Creek, who calls Nottingham in the United Kingdom home, was visiting in the Atlanta, Georgia area as part of his USA tour, in order to perform at the City Skies electronic music concert on November 7. Kevin Haller, whose house Jez was staying at, was also performing at the same concert. And Jim Combs, being the organizer and founder of the concert series, was of course going to be performing as well. So just for fun, the three decided to do a live concert on StillStream.com the night before the big show. And the results were so good that they decided to release the recordings as this album. WDIY 88.1FM & WWSP 90FM both make Combs Creek Haller 'Singularity' #2 for August 2010. WWSP Ambient Aether makes Singularity #7 for July 2010. WWSP 90 FM Ambient Aether/Space Continuum, Stevens Point, WI, played "Approaching Singularity" on August 8, 2010, August 1, 2010, and July 25, 2010. WXPN 88.5 FM Star's End (ambient, space music), Philadelphia, PA, played "Approaching Singularity" on August 15, 2010. Wow, this one ends like a classic Berlin school piece. I'm loving the old school here! WWSP 90 FM Ambient Aether/Space Continuum, Stevens Point, WI, played "Approaching Singularity" on July 18, 2010, July 11, 2010, and June 27, 2010. 'Singularity' is #12 for June 2010. Additionally, WDIY 88.1FM places 'Singularity' in Top 20 for June 2010. WWSP 90 FM Ambient Aether/Space Continuum, Stevens Point, WI, played "Approaching Singularity" on June 13, 2010, June 6, 2010, May 30, 2010, May 23, 2010, May 16, 2010. Singularity is #1 for May 2010, #9 for April 2010 and #11 for March 2010. WWSP 90 FM Ambient Aether/Space Continuum, Stevens Point, WI, played "Approaching Singularity" on May 2, 2010, April 25, 2010, and April 11, 2010. Singularity is #11 for March 2010. WXPN 88.5 FM Star's End (ambient, space music), Philadelphia, PA, played "Approaching Singularity" on May 9, 2010. WXPN 88.5 FM Star's End (ambient, space music), Philadelphia, PA, played "Approaching Singularity" on April 18, 2010. Hypnagogue Podcast 24 features Singularity on their April 1, 2010 show. NPR member station WDIY 88.1 FM, Allentown and Bethlehem, PA, 93.9 FM in Easton, PA and Phillipsburg, NJ, 93.7 FM in Fogelsville and Trexlertown, and webcasting on the internet- "Trapped Inside Singularity" played on Galactic Travels show #678, April 1, 2010. WWSP 90 FM Ambient Aether/Space Continuum (new age, ambient, smooth jazz, world music, college), Stevens Point, WI, played "Approaching Singularity" on March 28, 2010. Hypnagogue Reviews also provided a mini-review in their "Off The Grid" column: Off the Grid Because I recieve so much music for review, I don't usually buy or download it. Now and then, though, I just can't help myself. I don't review what I get for myself, but I do write about it here, Off the Grid. 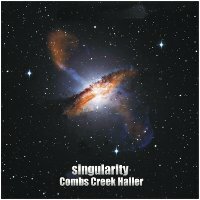 The thing you need to know going into the Combs Creek Haller offering, Singularity, is that it's a flat-out live improvised session between three artists who'd never really met and never rehearsed. Getting ready for a City Skies monthly showcase, Jim Combs (aka Sensitive Chaos), Jez Creek (Modulator ESP) and Kevin Haller (Burning Artist Sale(s)) decided to jam--and, thankfully, thought to record it. The upshot is that you get to listen to an astonishingly deep, very cool space-music journey that you will absolutely lose yourself in. And considering that it's free from Earth Mantra, it's worth your download time. (The file is 243 MB in size.) If I was reviewing this, it would easily be a Hypnagogue Highly Recommended work. NPR member station WDIY 88.1 FM, Allentown and Bethlehem, PA, 93.9 FM in Easton, PA and Phillipsburg, NJ, 93.7 FM in Fogelsville and Trexlertown, and webcasting on the internet- "Approaching Singularity" played on Galactic Travels show #676, March 18, 2010. WMUH 91.7 FM Thought Radio (electronic, ambient, spacemusic, Progressive Rock, and an eclectic mix of other genres), Allentown, PA, played "Trapped Inside Singularity" on March 20, 2010. WWSP 90 FM Ambient Aether/Space Continuum (new age, ambient, smooth jazz, world music, college), Stevens Point, WI, played "Approaching Singularity" on March 21, 2010. StillStream.com (ambient format)- Played "Trapped Inside Singularity" on March 18, 2010 and February 7, 2010, and "Approaching Singularity" on February 5, 2010.